The Bank of America® Platinum Visa® Business credit card offers a low APR and average sign-up bonus, but not much more beyond that. There is neither a rewards program nor cash back, meaning individuals and businesses will be receiving very few benefits. Despite having no annual fee, overall, we fail to see why businesses should opt for this card rather than any of its alternatives. The Bank of America® Platinum Visa® Business credit card finds its greatest strength in having a low APR. In other words, businesses are not punished as severely as they would on most other business credit cards if they have an outstanding balance by the end of the billing cycle. Furthermore, the card provides a 0% introductory APR on purchases for the first seven billing cycles after the account is opened. Do you or your business often struggle to fully pay off your balance from one billing cycle to the next? If so, then the low APR of this card and its 0% introductory APR may provide the solutions to your problems. The card also has no annual fee, so it could be a good idea to have this credit card and to use it to make purchases that your business needs but that you know you will not be able to pay off immediately. Through this strategy, you would end up paying the low APR of the Bank of America® Platinum Visa® Business credit card rather than the likely higher APR of your primary business credit card. While the Bank of America® Platinum Visa® Business credit card does not offer any significant rewards or cashback system, it does offer a conditional sign-up bonus. Cardmembers can earn a $300 statement credit bonus after spending at least $3,000 in net purchases in the first 90 days of opening the account. We imagine the conditions for the sign-up bonus will be easy for most businesses to achieve, making the sign-up bonus a fairly strong incentive. However, this is all the money you will ever get back from the card. There are many other credit cards that offer similar sign-up bonuses, either in statement credit or bonus points, while still being rewards cards. The one-time benefit of statement credit is welcome, but most businesses would benefit far more in the long-term from selecting a rewards card instead. The Bank of America® Platinum Visa® Business credit card offers a handful of services that most business will be able to appreciate. The card provides all cardmembers access to both MyReportCenter and QuickBooks. MyReportCenter is a helpful tool for managing the cash flow of small to midsize businesses. QuickBooks is another great business tool, particularly for handling payrolls and employee benefits in one comprehensive platform. You are also provided with a modest array of travel-related insurance to help protect your business. You are given car rental insurance, travel accident insurance and lost luggage assistance. Although these perks pale in comparison to most dedicated business travel cards, they are still helpful if you don't currently have a credit card that rewards you when you make travel purchases. 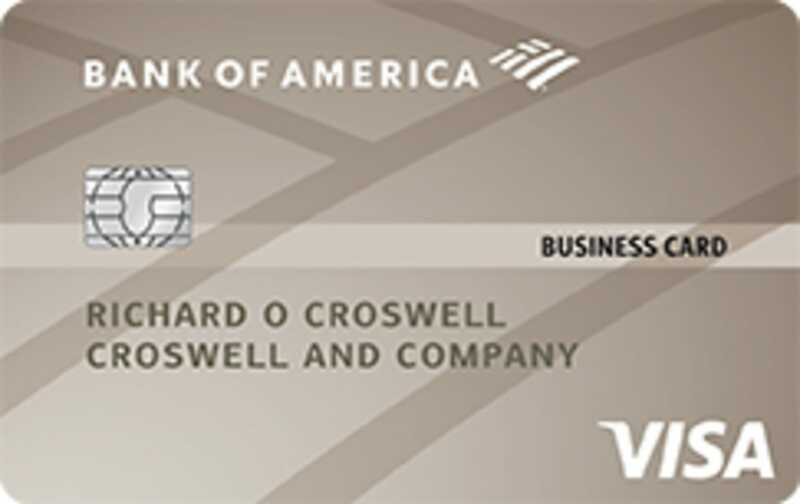 The Bank of America® Platinum Visa® Business credit card is a bare bones credit card that offers a very limited set of benefits. Most notably, the card does not offer any rewards or cashback program, which is unlike most elite business credit cards. The lack of these programs means that the credit card has no means to reward cardmembers for their expenditures. The sign-up bonus therefore becomes the only instance where you will be able to get actual monetary value from owning and using this card for your small business. In the long-run, there is no reason why you should settle for the Bank of America® Platinum Visa® Business credit card over any of its alternatives, some of which also come with no annual fee and a 0% introductory APR. The following alternatives can offer you more value and rewards than the Bank of America® Platinum Visa® Business credit card. All of the following are rewards credit cards, meaning they will be rewarding you for every dollar that you spend, which can then be redeemed. We understand that the core demographic of people who are interested in the Bank of America® Platinum Visa® Business credit card are individuals who are looking for a business card with no annual fee, so all of the following cards also do not charge an annual fee. 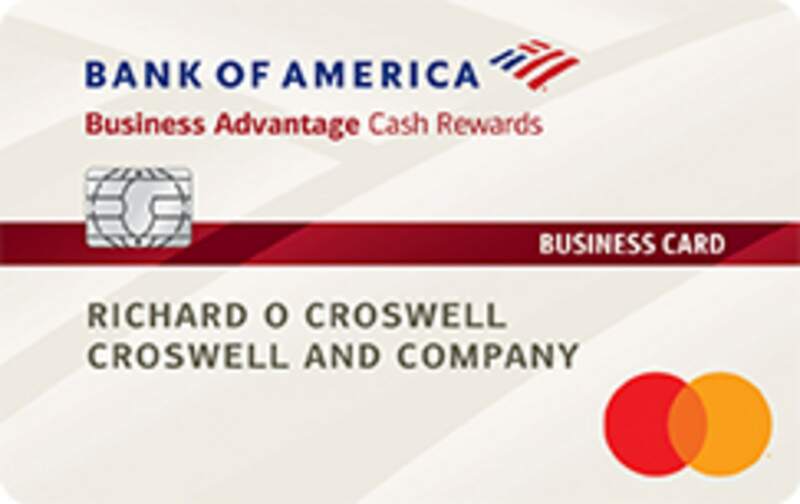 The Bank of America® Business Advantage Cash Rewards Mastercard® credit card would be an excellent choice for any business that wants to maximize the amount of money they earn through cash back on their purchases. The card offers 3% cash back from one of the following six categories: gas stations (default), office supply stores, travel, TV/telecom & wireless, computer services or business consulting services, 2% cash back on dining (for the first $50,000 in combined choice category/dining purchases each calendar year, 1% thereafter) and 1% cash back on all other purchases. This credit card also features the exact same sign-up bonus as the Bank of America® Platinum Visa® Business credit card: earn $300 in statement credit after spending $3,000 within the first 90 days of opening the account. The combination of having the same sign-up bonus, no annual fee, but a strong cashback system catered towards businesses makes this card an all-around better choice for most businesses. 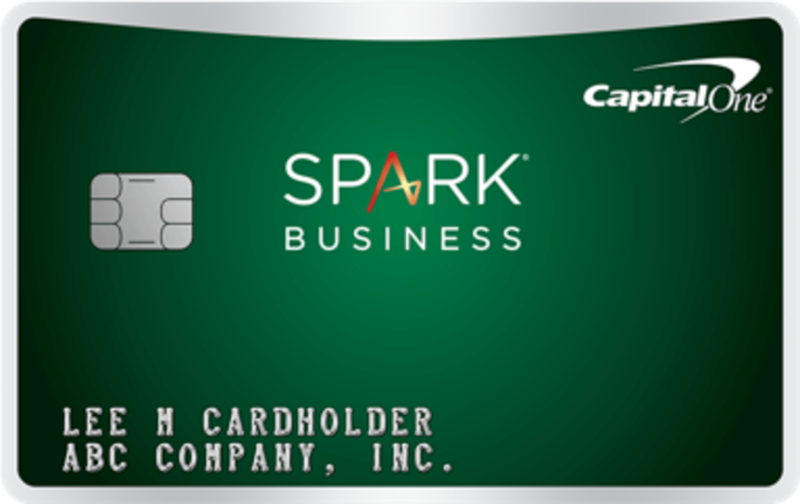 The Capital One® Spark® Cash Select for Business is another excellent cash back credit card that features no annual fee and a 0% introductory APR for the first nine months — even longer than that of the Bank of America® Platinum Visa® Business credit card. You will also be able to earn a one-time $200 cash bonus after spending $3,000 on purchases within the first 3 months. This card's biggest strength lies in its cash back program: an unlimited 1.5% cash back on all purchases. Depending on how much money you spend, this could mean that thousands of dollars can be put back into your business. Regardless of however much money you end up receiving from cash back, that amount will always be higher than how much you would have received if you had done your transactions on the Bank of America® Platinum Visa® Business credit card since it lacks a rewards program altogether. 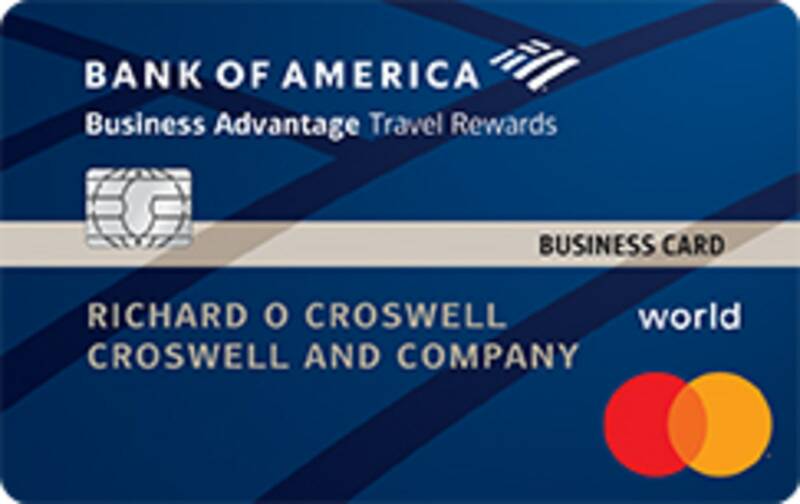 The Bank of America® Business Advantage Travel Rewards World Mastercard® credit card is another credit card that has absolutely no annual fee and features a 0% introductory APR for the first nine billing cycles of opening an account. The sign-up bonus associated with this card is 25,000 points after spending $1,000 in net purchases in the first 60 days. What separates this card the most from the Bank of America® Platinum Visa® Business credit card is that this card is a dedicated travel rewards card with excellent point rates. You will be able to earn 3 points per dollar for travel expenses that were booked through the Bank of America Travel Center. Beyond this, you will receive unlimited 1.5 points for every dollar spent on all other purchases. Therefore, not only will it serve as a great travel card, but it will also function as a solid all-around rewards card given its consistent points rate across all categories. If your business demands travel, then the Bank of America® Business Advantage Travel Rewards World Mastercard® credit card credit card would be an excellent choice that will reward you well for your purchases. Even if your only reasons for applying for the Bank of America® Platinum Visa® Business credit card is because of the card’s $0 annual fee and a 0% introductory APR, there are still better choices that offer the same benefits. All of the alternatives listed above would be better choices for almost all businesses of any size when compared to the Bank of America® Platinum Visa® Business credit card. The lack of either a cashback or rewards program significantly diminishes the appeal of this card.